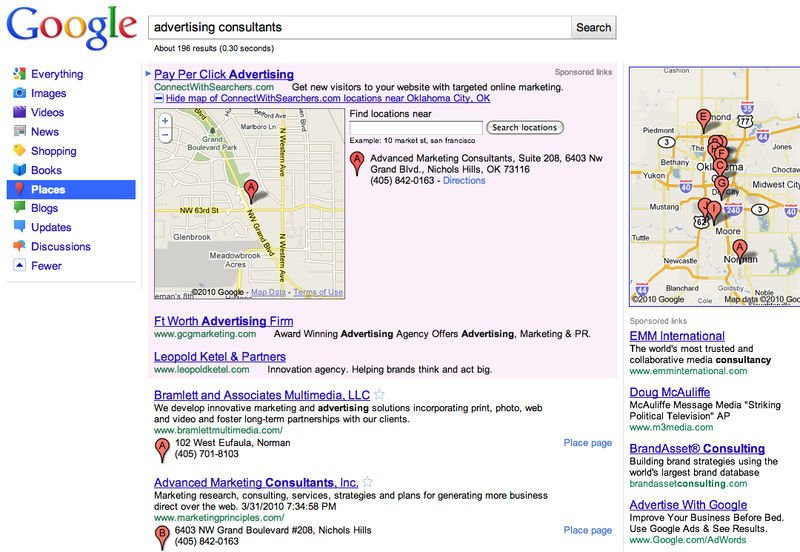 With the advent of Google Place Search, won’t the practice of Place SEO soon follow? Pounding away at national and local online marketing for longer than I care to remember, it now appears my work hasn’t been in vain. In the sample Google Places page below (reached from an incognito browser), both my Google Adwords paid search ad and my Google Places listing sit atop Google’s new Places results page. A quick check of several other keywords relevant to my business produced similar results. As an added bonus, my expanded paid and organic place results occupy roughly 50% of the available screen real estate above the fold. From a marketer’s perspective, it looks like everything has fallen into place – the right place. This entry was posted on October 28, 2010 at 9:09 am and is filed under Google Places, Local Online Marketing, Place Optimization, Place Search, Place SEO. You can follow any responses to this entry through the RSS 2.0 feed. You can leave a response, or trackback from your own site.